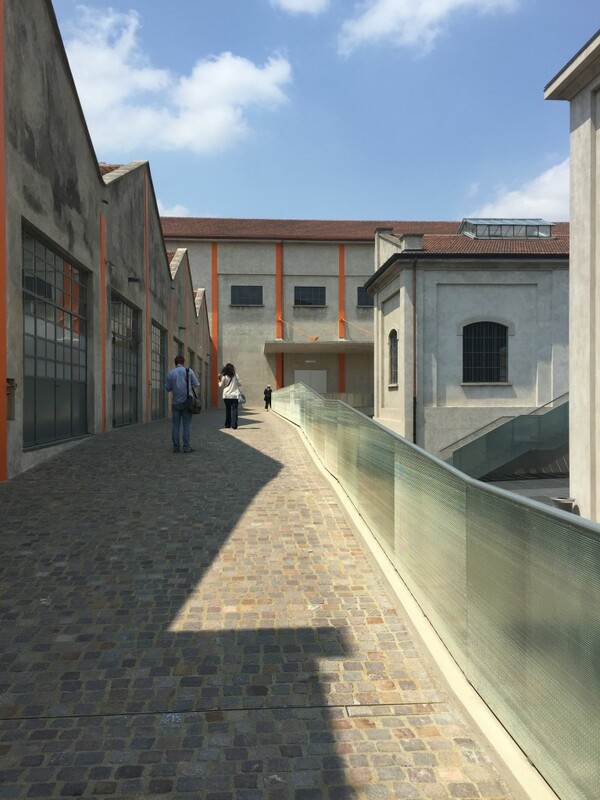 Last weekend I went to Fondazione Prada in Milan. 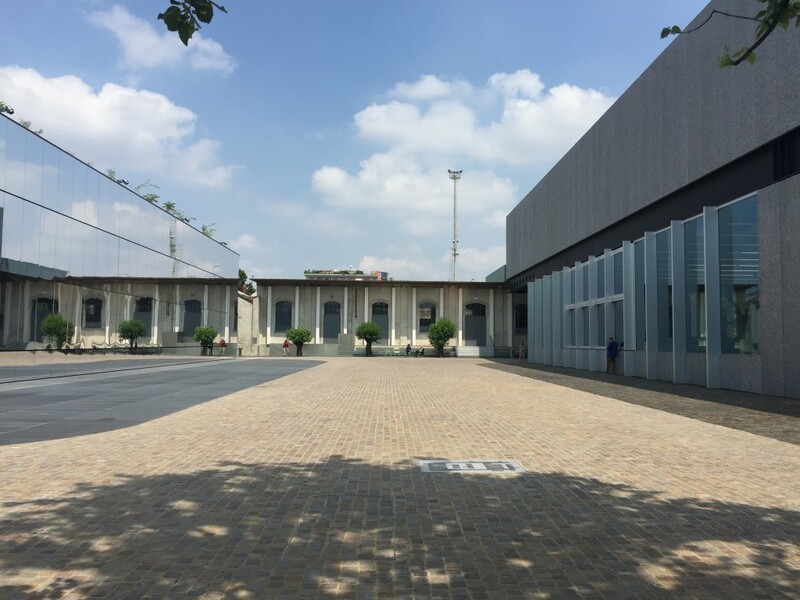 It is a very recent addition to the Milan scenery, having only opened on the 9th of May this year. 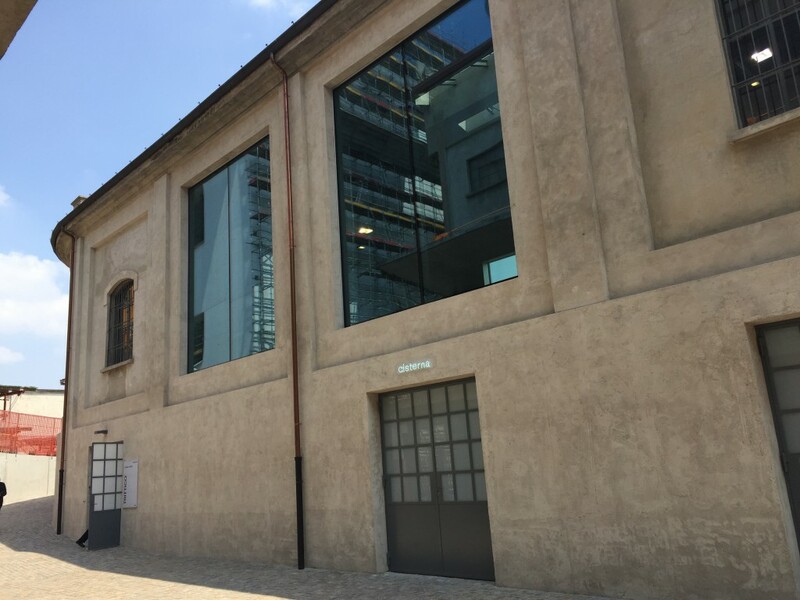 The Fondazione Prada is an institution dedicated to contemporary art and culture and the new building is meant to house exhibitions and special projects organized by Fondazione Prada. 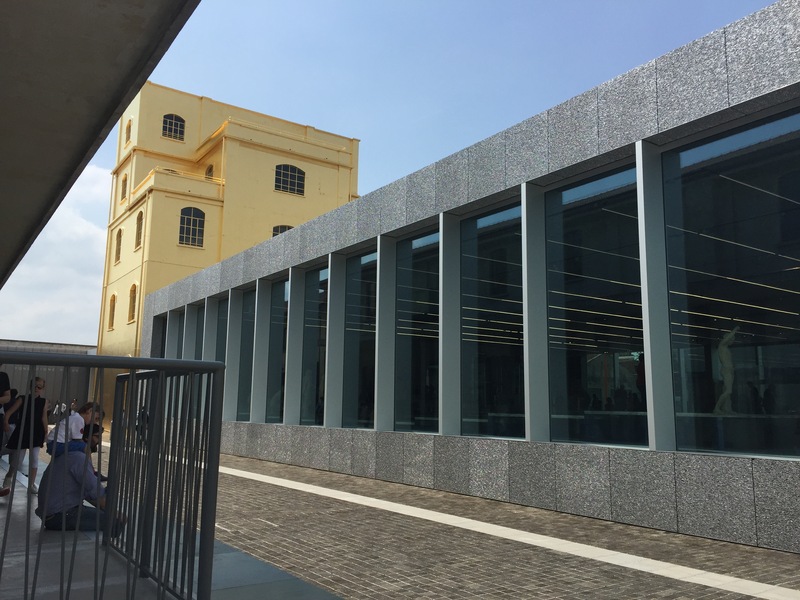 The building was designed by OMA and consists of the transformation of a former distillery from the 1910’s and the addition of three buildings to the site. The open space in between the buildings is accessible for everyone, you only need a ticket to enter the exhibitionspaces inside the buildings. Me and my friend chose not to visit the exhibitions, but instead just wandered around the buildings. One of the buildings is still under construction, so the whole complex is not yet finished. 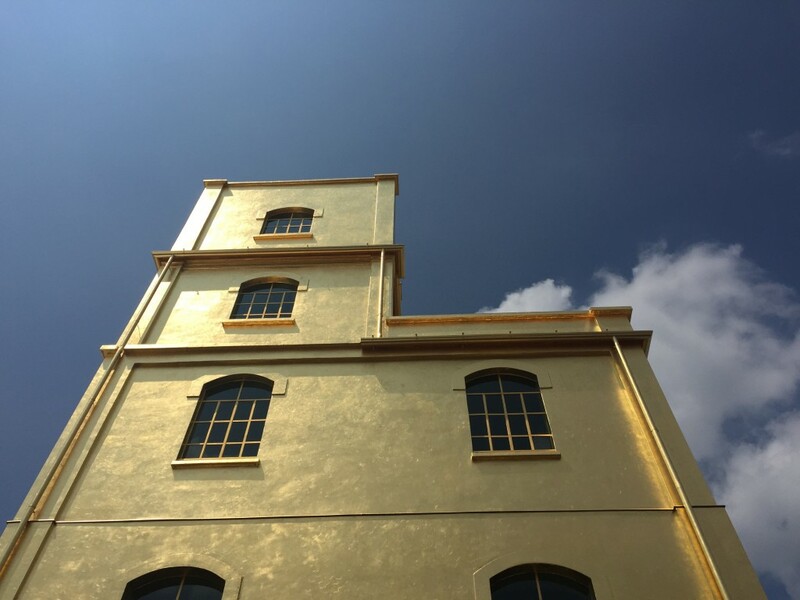 The first thing you will notice when walking towards the Fondazione Prada, is the fact that one of the higher buildings is gold. Yes, that’s right, they covered the entire facade with gold foil and it looks amazing. The gold works really well with the colors of the other buildings, while also being a real eye-catcher. If there is one thing I have noticed in Milan, it is that Italians love their mirrors. So why should it be any different in this new art complex? So one of the buildings has a facade made out of mirrors. Here is the only slight flaw we found in the buildings, because there are two doors in the facade (not in the picture) and they have ugly doorknobs sticking out, breaking the smooth surface of the mirrored facade. 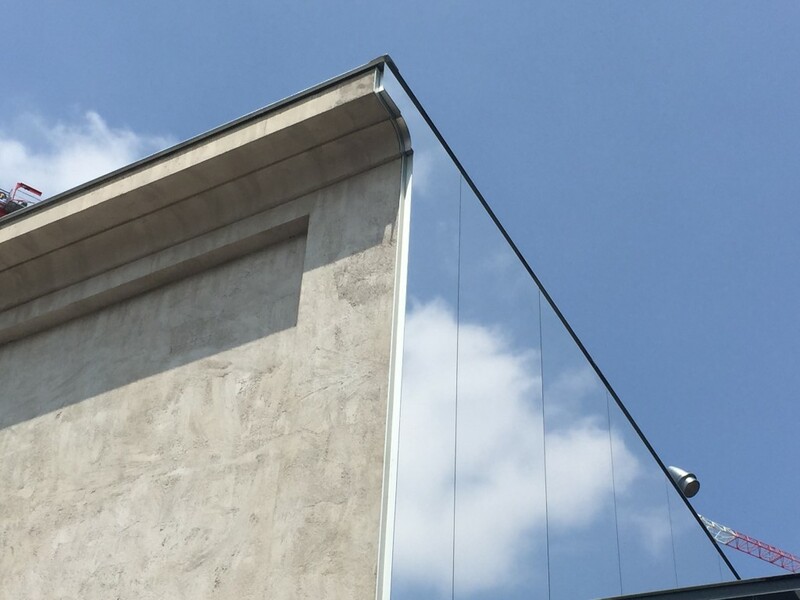 Also amazing: this detail at the top corner where you can see that it is just a ‘thin’ layer of mirror added to the building. For the existing buildings OMA has chosen to add small pops of color to tie it in with the rest of the project. I think it looks amazing and very contemporary, which is probably what they intended. 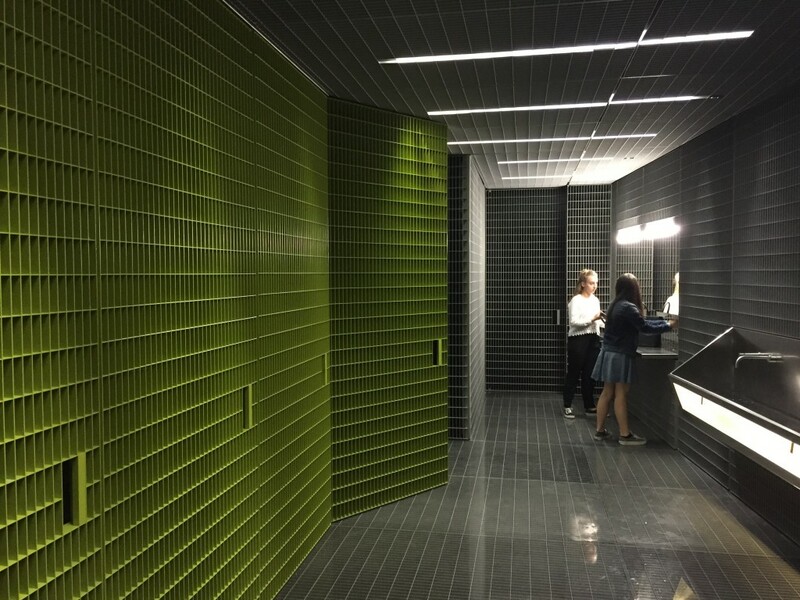 Koolhaas’s love for metal grates is also very visible in the project, not just in the balustrade but also in floor material in some parts of the site. However the metal grate love becomes impossible to miss when you go down to the garderobe and the toilets. The entire bottom floor consists of walls of metal grates and floors of metal grates (as you can see). It is like stepping into a jail. The idea of jail gets even more intense when you enter the bathrooms themselves, with metal sinks and toilets. Also the doors (in green) are very heavy and completely close you in. So you really feel like you are in a cell-like space. For some reason this space really reminded me of the Kunsthal in Rotterdam, but way more intense.